We are reliably informed that Daisy McCrackin was born in San Francisco and now lives in Los Angeles. So what else can I add, well having read her bio on MySpace her original move to LA was to develop an acting career, with some notable Hollywood credits to her name including 3000 Miles To Graceland (with Kurt Russell and Kevin Costner.) 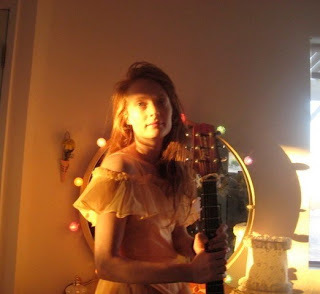 She also had the honor of being one of Michael Myers teen victims in a Halloween sequel from 2002 (no wonder she switched over to a music career), however clearly her artistic yearnings eventually led her away from LA for a while as she slowly developed her song writing and guitar skills. Having listened to her debut release 'Rodeo Grounds' I have to say there is something special about Daisy and her music. I would imagine she will appeal to both folk and indie fans alike, the comparisons are there (from Joni Mitchell to Beth Orton) however she has a unique and very intimate style that has a personal and charming edge. Hurrah for Daisy! Love the songs, keep em coming! I love this girl! As one fan said on Itunes : Refreshing, just buy it!!! just listened to Tell her, awesome. Thanks.